This project explores several areas: the first is a continuation of ongoing research into the cross pollination of two anciently intertwined cultures – Greece and Iran. Elements of their respective musical heritages coexist wonderfully and inspire and strengthen one another while providing the acoustic environment for the investigation and retelling of overlapping mythological traditions which are becoming increasing forgotten or ignored in our society today and which I believe are incredibly rich and diverse. Specific inspiration is drawn from Persian and Greek texts such as »Conference of the Birds« by Attar and Homer’s »Odyssey«. 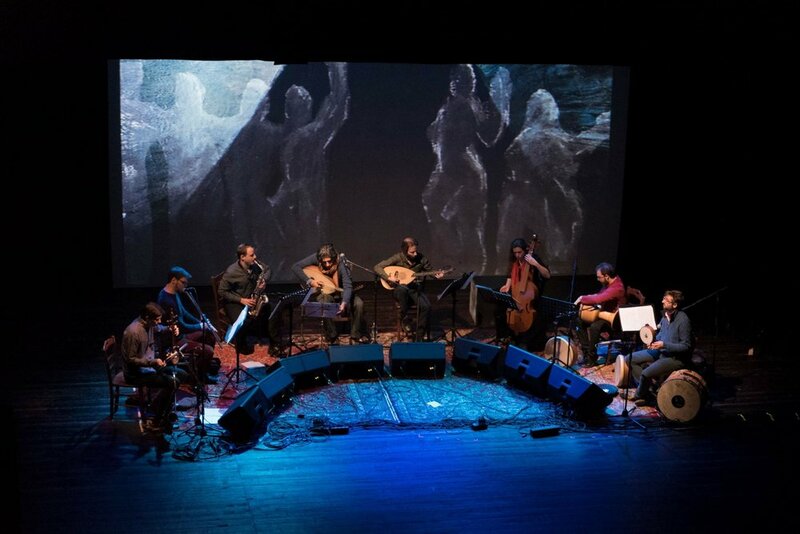 These narratives unfold simultaneously through original instrumental composition, song and improvisation – like a modern day ashik or troubadour might use them. Relevent and important for this project is how listeners perceive or receive music. Our experience of music is changing as we rapidly become more and more a visual based society. This is in no small part due to the present digital age which encourages forms of communication and entertainment which rely on the internet and more specifically screens for the transmission of information. Taking this in consideration this project aims to experiment with the use of images to accompany our musical storytelling but with some differences. Using shadow puppetry as inspiration screens, back lighting and projections will be used to influence the way the the audience “watches” the music and experiment with three basic visual components. Elements such as back lighting, digitalised animation and projections are combined in order to both aid the ‘storytelling’ process and guide the visual listener into another way of connecting to the music narrative.